Photo courtesy of Trevor Martin: A crew removes the Uptown Alliance's parklet in front of the SIFF Cinema on Thursday, Oct. 18. The Uptown Alliance has removed its parklet in front of the SIFF Cinema, citing difficulties maintaining the space. 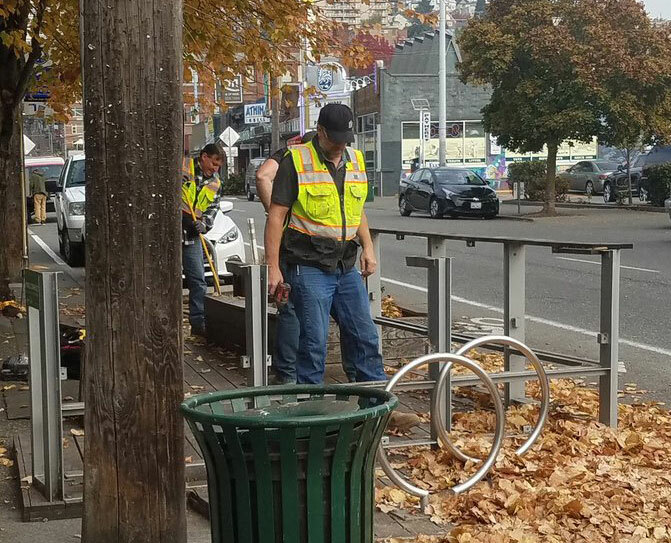 A crew was out removing the parklet at 511 Queen Anne Ave. N. on Thursday. Its features included seating, a mini-library and bike parking, and the parklet took the Uptown Alliance years to make a reality. The neighborhood group began working with the city’s planning department in 2012, and the Seattle Parks Foundation hosted the parklet’s fundraising campaign, which reached its $20,000 goal. The Uptown parklet was the sixth to be set up in Seattle through the city’s Parklet Pilot program, for which 13 were approved. A grand opening celebration was held in February 2015, and included a ribbon-cutting and speech by the mayor. While many people showed up for the grand opening, not so many have chipped in to maintain the parklet, according to an email from UA co-president Rick Hoooper to the Queen Anne News. Litter has become an increasing issue in the heart of Uptown, and it didn’t help that the trash can next to the parklet is usually overflowing, according to Hooper. The parklet also needed periodic scrubbing due to its exposure to the elements. Some people online have suggested heavy maintenance needs were due to people experiencing homelessness using the parklet, but Hooper states that isn’t the case. As the permit owner for the Uptown parklet, it was UA’s responsibility to install and maintain it. Queen Anne News has reached out to SIFF, and will update this article with a response if one is provided. Hooper tells Queen Anne News bids were solicited for community cleanup operations, but UA lacked the funding to sustain such a program. Concluding the parklet would not last in its current location, UA looked for a space to relocate the amenity, and one “where ideally a business could ‘own’ the parklet for maintenance,” according to Hooper. The Uptown Alliance decided about a month ago that the parklet would need to come down. Prior to its installation, the parklet was just two parking spaces, and likely will return to being used as such.